Wedding PR: Huffington Post, SheFinds, Catersource and more! It’s the start of another week, and we’ve got client features in Huffington Post, SheFInds, Catersource and more to share! See it all below. 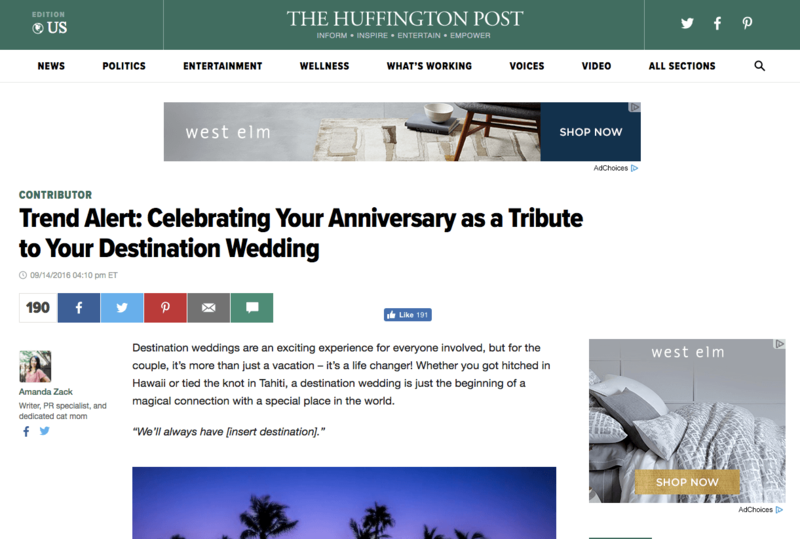 Destination Weddings and Be Photography were featured on Huffington Post in the article Trend Alert: Celebrating Your Anniversary as a Tribute to Your Destination Wedding. See the full feature here. OFD Consulting was featured on Special Events with the guest blog PR Tools This PR Pro Can’t Live Without. See the full article here. Bergerons Flowers were featured on Modern Jewish Wedding with the wedding of Claudia and Joseph. See the full feature here. OFD Consulting was featured on Catersource with the guest article Navigating Company Changes with Grace. See the full article here. All Inclusive Outlet was featured in the Huffington Post article What Travel Destination is For You? See the full article here. Destination Weddings was featured on Aisle Society with a beachside Mexico wedding. See the full feature here. Taylor’d Events was featured on Catersource with the guest article Employees vs. Brand Ambassadors: What’s the Difference? See the full article here. Cocoon Events Management Group was featured on Huffington Post in the article The Benefits of Booking a Planner who Handles Everything. See the full feature here. Belladeux Event Design, Taylor’d Events, and Mike B Photography were featured on SheFinds in the roundup 11 Mistakes Wedding Guests Make. See the full feature here. Taylor’d Events was featured on Timeline Genius with the guest article Managing Client Expectations and Setting Boundaries. See the full feature here.